Charles Schwab is a leader in the brokerage space and offer competitive pricing and a wide range of investment products. Charles Schwab is one of the biggest brokers in the industry today. They cater for investors of all experience levels. They have been in the industry since 1973 and they now have more than $3.18 trillion in client assets. In addition to offering the trading of securities, futures and options, they also have FDIC backed banking services and retirement account options. They play host to over 10.5 million brokerage accounts. They try to lead the way in the industry in terms of the latest trends. In 2017 they underwent a major overhaul of their commissions and fees. This saw Charles Schwab become a lot more competitive in terms of costs with the rest of the industry. This Charles Schwab broker review will look at the various aspects which makes it one of the market leaders. Following an overhaul of their cost structure in 2017, Charles Schwab is ahead of a lot of their competitors in terms of their fees structures. They charge just $4.95 per stock trade, which is $2 cheaper than some of their close competitors. There are three top quality trading platforms to choose from with Charles Schwab. Each of them has their own special features and you can choose which one is best suited to your specific needs. While they offer 24/7 customer support like most of their competitors, the Charles Schwab customer support team is a level above most of their competitors. They are well trained and can deal with most issues and problems in a rapid manner. The mobile trading apps offered by Charles Schwab are a bit behind their main competitors. More experienced and active traders will not like the basic features and lack of tools that are part of the mobile apps. While there is a wealth of information available through the Charles Schwab website, you are inundated with information and it can be hard to navigate around the site. At Schwab, our commitment to your satisfaction is backed by a guarantee. If for any reason you're not completely satisfied, we'll refund your fee or commission and work with you to make things right. In terms of the largest full-service brokers, Charles Schwab has one of the best commission and fee structures. They have a flat rate commission of $4.95 for stock trades, which is $2 cheaper than major competitors TD Ameritrade and E*Trade. For options contracts, there is an additional charge on top of the $4.95 of $0.65 for each contract. They have more than 250 commission-free ETFs on offer, with only TD Ameritrade offering more. There are also more than 4,000 mutual funds that have am initial sales charges or transaction costs. You are dealing with some of the lowest expense ratios you will find with the leading online brokers. There are three different trading platforms on offer with Charles Schwab. All customers will have access to any of the platforms they prefer and there are no limitations in place. The desktop platform StreetSmart Edge is a bit more advanced than the other options and is suited best for active traders. You have a lot of customizability options and it is very well designed as an interface. For advance charting options, you will be best served with the StreetSmart.com platform. It is a bit older than the other two options and does lack somewhat in comparison with advanced features. There are certain browsers that no longer support the use of Java-based systems, such as this one. Therefore, the likes of Google Chrome will not work with this platform. Finally, the StreetSmart Central platform was first offered in 2017 and is another web based option. It is only accessible to those users who have been given approval for engaging in margin or futures trading. It has full trading capabilities and is perfect for those trading futures. Charles Schwab has a mobile offering that is well-suited to most devices and puts an emphasis on clean interfaces and smooth user experiences. The main downside of their mobile apps is the lack of functionality when it comes to quotes and alerts. You can’t set even the most basic of alerts for stock prices. While quotes are available in real-time, you need to refresh the page each time manually when you want to see the latest prices. Their mobile apps do the job for those looking for the more basic capabilities of mobile trading. However, their offering is still a bit behind their competitors in this regard. Charles Schwab has a varying range of different investment accounts to choose from. 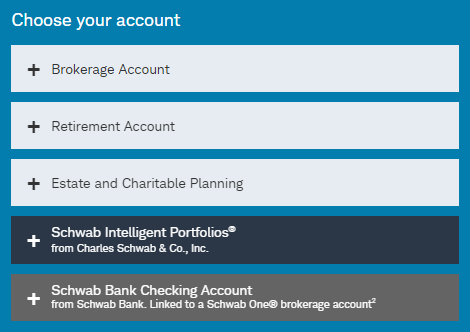 These range from brokerage accounts, retirement accounts, estate and charitable planning accounts, Schwab Intelligent Portfolios and Schwab checking accounts. For brokerage accounts, you can have a single or a joint account. This gives you access to trading a wide range of investment types, as well as getting access to third party research systems and proprietary analysis software. There is no fee in place for opening an account and there are no minimum account requirements in place. If you want to take a more passive approach, you can open the Intelligent Portfolios account and avail of the fully automated investment advisory service. There are many different ways to make a deposit to your Charles Schwab account. You can make an online transfer. The first ever transfer you make will take about 5 business days to process. Thereafter, it will take between 1 and 2 business days. Mobile deposits will take between 1-2 days to process. If you want to send a check, it will take 7 business days to process. If you deposit via cheque at one of the physical branches, then the deposit will process on the same day. You are able to transfer an account from another broker over to Charles Schwab. This will take between 5 and 10 business days for most types of investments. Transfers from insurance companies and mutual funds firms could take longer to transfer. Finally, you can deposit through a wire transfer, which will usually process within 24 hours. You can use all of the above methods if you want to make a withdrawal from your Charles Schwab brokerage account. There will be no fees levied on you by Charles Schwab, but your bank may levy their own charges depending on the type of transaction. Just like most of the online brokers, you will have 24/7 customer support available if you have any questions or concerns. They have a quality phone offering, but unlike a lot of their competitors, their online chat option is also of a high quality. This is often the best way to get a quick answer on the majority of issues. You can also visit one of the 350 physical Charles Schwab branches if you prefer to deal with an issue in-person. They also have regular workshops and events which can be useful for a lot of people. Charles Schwab takes their security seriously. They are part of the SIPC which means that customer securities of up to $500,000 in value will be protected, as well as up to $250,000 in cash deposits will be kept safe in case Charles Schwab goes insolvent. All securities that are fully paid for will legally be owned by the user and these are kept in a segregated account. Therefore, Charles Schwab cannot use these securities to pay off their creditors. In terms of security, the company bases their relationship with the user on trust. They offer a Schwab Security Guarantee which says that if there is any unauthorized activity in your account, you will be 100% covered in the case of any losses. They do protect your valuable data in a myriad of ways. It has many layers and they work closely with governed agencies, other financial services firms and law enforcement to counter any potential threats. They keep most of their back door security measures private to ensure that they are not giving would be hackers and infiltrators an edge.